So you’re either having thoughts about buying one or you’ve already acquired your, perhaps, first electric scooter. Hopefully, you’ve taken it for its first spin and you got so amazed just how well it operates, that you want to know more about what happens underneath the hood. Thing is these electric rides might seem sophisticated and very complicated, but they really aren’t. In order for you to understand how these things operate we first need to know about all those small pieces that actually make up your electric scoot. The thing is different models have different types of motors, extra features, and so on. This list consists of those things vital to you being able to operate it and use it safely. You’re not going to find the extra fuzz here, like for example lights. An electric scooter consists of the above-mentioned parts plus extras. What type of extra parts you have on your electric scooter is often determined by its price. In order to make it work these parts needs to communicate with each other in a way that gives you control over how it should operate. The motherboard/management system is your scooters brain. This part tells every other part exactly what to do. It gathers information from the battery, motor, throttle, and if available electric brakes. It then accesses the information gathered and sends it out to each part. I would like to say that the motor which can be a chain-driven motor mounted outside of the wheel or a hub motor which is mounted inside of the rim of your wheel is the muscles of your ride. Hub motors are far superior to outboard motors in terms of sound levels, response time, torque and power. This makes your ride go forward, but we need more parts to cooperate with the motor in order for it to work. That’s when the throttle and battery come in to play. When you press the throttle down you tell the motherboard that okay, we want to go forward at this speed. You can press it just a little to go slow or press it down completely to go fast. That is if you have a variable throttle. The motherboard then opens the floodgates holding the battery power in check. The energy from the battery then travels through a set of wirings towards the motor which then together with the energy from the battery also gets a signal of how fast it should rotate. This signal is sent from the motherboard telling it the exact momentum needed to achieve the speed you as a rider has chosen by pressing down the throttle. The motor starts to rotate and off you go! But hey, if you go forward you want to be able to stop too, right? We have the footbrake where you use your heel to clamp down on the cover of the back wheel in order to create resistance between the cover and the wheel, which then eventually makes you slow down and stop. As the second option we have the handbrake, here you use a disc brake mounted either on the front or rear wheel, most often in the rear. When you press the hand clutch it will create pressure on the brake disc and then start to slow down. The third option is the electric brake system. These are very common on hub motors. Here instead of increasing the rotation speed, the motor uses a generative braking system that increases the resistance between the magnets inside of your motor. This resistance pressure eventually makes it stop completely. A neat thing with electric brakes is that if they have the regenerative function, they will recharge your battery while you brake or go fast downhill. My favorites are a combination of disc and regenerative brakes. The disc brake can be used in emergencies when the electric brake shuts off due to an empty battery or error, or when the electric brake just isn’t enough. Using the electric brake as often as possible will, however, give you a longer riding distance per charge as transforms the braking energy into a battery recharge. The frame itself is nothing but something to mount everything upon, and for you to be able to use these parts effectively you need somewhere to stand on. 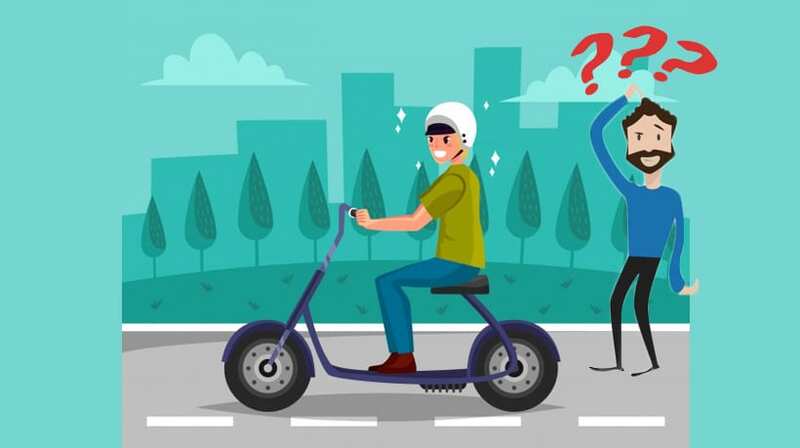 Just remember that there are many different electric scooter models available on today’s market and these can have minor differences when it comes to how they operate. This is a general guide to how they operate. It includes no extra fuzz just a plain and simple explanation on how your electric scooter is able to carry you going forward. Razor E200/E200S VS RX200 review - Which one is the better pick?